For other people named Alice Evans, see Alice Evans (disambiguation). Alice Jane Evans is an English actress. ^ "Alice Evans". NNDB. Retrieved 14 September 2017. ^ a b "Meet La Belle Anglaise" by Anna Pursglove, Evening Standard, 15 December 2000. ^ Mia Sulpor (15 November 2000). "Disney lets dogs out". Variety. Retrieved 2 June 2016. ^ "102 Dalmatians (2000)". British Board of Film Classification. Retrieved 15 November 2015. ^ "Alice Evans Biography". IMDB. Retrieved 17 March 2017. ^ Shaunna Murphy (9 February 2012). "'The Vampire Diaries': Talk tonight's shocking twist, and find out what's next from producer Julie Plec". Entertainment Weekly. Retrieved 2 June 2016. When Original vampire mama Esther (Alice Evans) returned to Mystic Falls after spending the last millennium six feet under, we knew she’d have some deeply hidden tricks up her sleeve. ^ Lucy Cavendish (22 January 2001). "La jeune fille anglaise". The Daily Telegraph. Retrieved 2 June 2016. ^ Ioan Gruffudd, Late Late Show with Craig Ferguson, 21 February 2007. ^ Mary Margaret (15 September 2007). "Fantastic Four Star Ioan Gruffudd Gets Married". People. Retrieved 23 September 2014. ^ Andrew Asare (2 October 2013). "Ioan Gruffudd and Alice Evans welcome second child". Entertainment Weekly. Retrieved 2 June 2016. ^ "Alice Evans". Lockerdome. Retrieved 15 December 2015. ^ "MegaRace 2 (DOS)". Moby Games. Retrieved 15 December 2015. 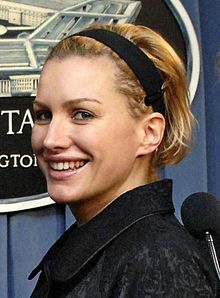 Wikimedia Commons has media related to Alice Evans. This page was last edited on 14 April 2019, at 05:12 (UTC).